Everything but the Candy - Easter Baskets for Little Boys Mama Say What?! | Mama Say What?! When you have a little one, celebrating holidays can be a whole new ball game! Our little man was a December baby, so most of his first holidays were low key… he was only nine days old on his first Christmas, two months on Valentine’s Day and four months at Easter. 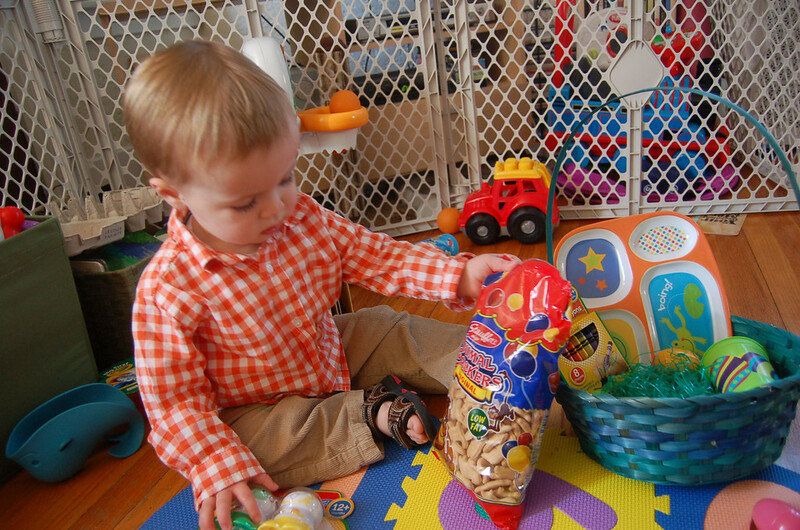 For his second Easter, he was about 16 months old and he got a little Easter basket filled with goodies. When your kiddos are young, most parents will probably be steering away from candy… at least for a couple of years! So what are some other go-to goodies to fill your little man’s basket with? We put in his first set of markers and crayons. Crayola has a great “series” of craft supplies designed especially for toddlers. The crayons were large and easier to hold because of their triangular shape and the markers were short and round with cute designs that look like animals. Some other additions might include coloring books, toddler scissors and sidewalk chalk. 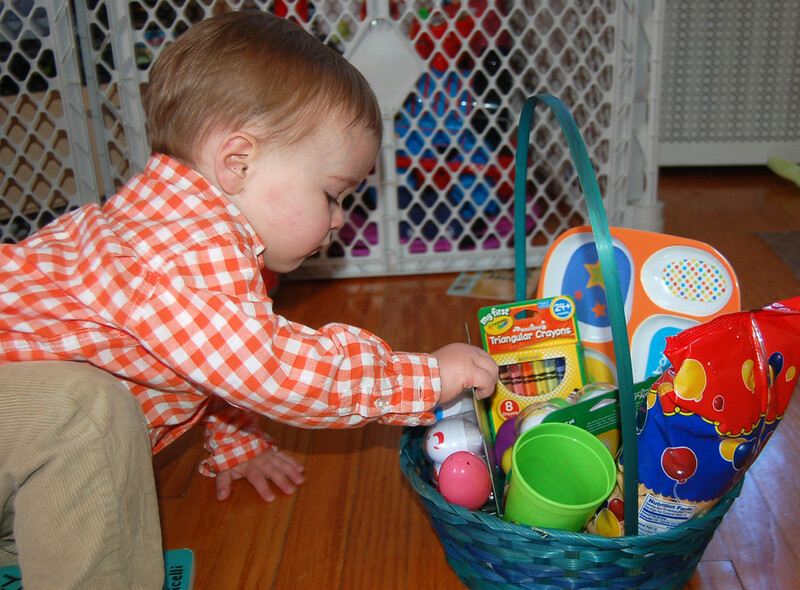 Our little guy had been eating solids for almost a full year before this Easter basket was put together, but only had recently been eating “real” table foods and fewer purees. 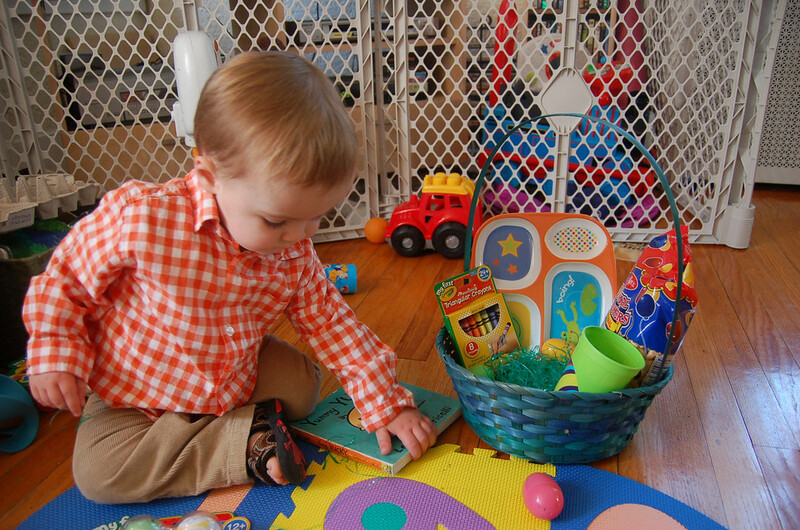 Included in his basket was a new plate – bright and colorful with four individual sections for lots of variety. He still uses this plate now! We also put in a small plastic cup with Easter and spring designs on it. He still uses this sometimes for him milk before bed. Some other ideas might include new silverware, bibs, sippy cups or a personalized placemat. We didn’t include any candy in his basket, but our little man does have quite an appetite. In his basket we included some animal crackers — one of his favorite snacks! Include some of your kiddos’ favorite snacks to make their basket extra special. Some other fun ideas you can include might be some small toys, new clothes, sandals or even some new toys for the pool or water park! Even though Easter is early this year (March 31st), spring and summer are right around the corner and hopefully that means some nice, warm weather. Include a pair of shades for those sunny days that are sure to be here soon! Added by MaryEllen M. on March 21, 2013. Aw man! I wish I would have thought of the animal crackers! I probably would have stolen them though- I love those darn things!